Outreach. I have heard stories of teams going to underground churches in China, into the heart of red light districts in Thailand, across the sea to the visible starvation in Uganda. These stories got me dreaming. I wanted to see the heart-wrenching images of desperately broken people in third world countries with my own eyes, face to face. I wanted to see myself making a tangible difference; I wanted to save lives. When I imagined my outreach experience, I definitely didn't picture driving a few short hours from my base in Townsville, Australia. And stopping there. But that's what happened. Our team of eight, (Danielle, Sarah A, Nicole, Tess, Beth, Ian, Maarten, and myself), piled into our faithful YWAM van and we headed down the road to the small town of Ayr. It would take ages to explain everything that happened on outreach, so I went with the "a picture is worth 1,000 words" option. Introducing the team! From left to right we have Sarah A, Ian, Danielle, Tess, Nicole, Maarten, Beth, and myself. A small baptist church became our home for the next 8 days. We were spoiled with a kitchen and even a shower! We slept in sleeping bags on the floor and with the screen doors open, letting in the moonlight and the sounds of night. This was our first glimpse of family hospitality in Ayr, and from that moment on it never ceased. Love transcends all things, including denominations. Sitting on top of Inkerman Hill. We got to pray over the city and worship together as a team as we overlooked the very area we'd be working in throughout the days to come. We saw for miles, but still our perspective was so limited; we only saw a city. God looks at the same view and instead sees each and every individual person, each and every broken heart, and each and every detail of each and every person's story. At a church one night, a few of us gave personal testimonies about a struggle in our lives that God helped us overcome. Sharing these testimonies invited other people to ask for prayer about things they wanted to partner with God to overcome in their own lives. It also encouraged others in the congregation to share their own personal testimonies. Graham was one of them (pictured above). He was born in a gutter, literally, and had been addicted to drugs and alcohol as long as he can remember. He was involved in gangs, fighting, prostitution, and "committed every sin except stealing," and even spent time in prison. Well... That story does not have the last word in his life! Graham met the Lord about a year ago and he says his life hasn't been the same since. Once he encountered true love, he could never go back to his old ways. It's only been a year but now he is clean and God is using his past for good. He is involved in prison ministry, telling people with similar stories about how God has the last word about their lives: they are redeemed! We went to primary and high schools all around the town to give anti-bullying seminars. These were interactive lessons where students learned about what bullying looks like, how to prevent it, and how to best love the people around them. At one school in particular, a grade seven class got extremely emotional during the presentation. A lot of students were bullied, and the hurt ran deep. We were able to give students some time at the end of our seminar to apologize to fellow classmates and start to build healthier foundations with one another. It was a powerful time of forgiveness and reconciliation. We were also given the opportunity to tell many schools and classes about the real meaning of Easter. In Australia, every school has a religious education program, and people are allowed to preach the gospel to students. What an opportunity! The team rallied our talents together to create an Easter presentation that consisted of a play, Bible story telling, and worship. This is a prayer box from one of the primary schools. This encourages students to talk to God, even if they are in school. God is everywhere! We also had the opportunity to attend a few boxing classes with at risk youth. This is Chappy (chaplain) Scott. He heads up the boxing program. His desire is to see young men and women funnel their pent up anger resulting from broken homes and circumstances in a healthy environment. He provides free classes and a home away from home for young people who don't have access to a safe place. One day, we went to the town's "special school." It's a school dedicated to providing an education only to students with special needs and behavior issues. There was so much life and happiness in that place! These kids taught me so much about maintaining joy despite the present circumstances. This is Blake! We made handprints with each of the students. I have never seen such excitement! Every handprint is uniquely beautiful, just like those kids. By the end of the week, we spoke at 9 schools and 6 churches, giving 7 Easter presentations and 4 anti-bullying seminars. We topped off the week with a movie night, inviting youth from the schools we spoke at. We had an "Awful Oscars" theme where students dressed whacky. Here's the girls from the team all decked out. We gave students an opportunity to have fun without going out and getting involved with drugs and alcohol, which is a big problem in the town. We even got to invite two students to come to church with us the next morning, and they ended up loving it. Phase two: off to Mackay! This is another town in Australia, about three hours from Ayr. On the way, we saw a rainbow, and felt God's indescribable peace. We helped out at "brekky club" at the local high school for a few mornings. We made and served breakfast with students before school. The school chaplain does this every day except Friday for an opportunity to bond with students and show them the love of God. One day we served a free 5 star breakfast to all the teachers. The only condition was that they would keep the acts of kindness going and love on someone else that day. On Anzac day, a war Memorial Day in Australia, we helped students make poppies. This is an age old tradition to remember the lives lost during World War 1. Camp Eagle is a local Christian camp where students go to learn about and fall in love with God. Each year has a theme, and this year's was "home." 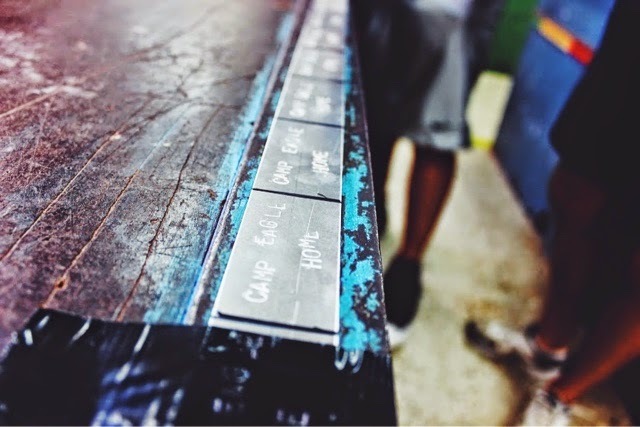 We made dog tags for each of the camp attendees, with a reminder of home on each one. Heaven is home! On Good Friday, we participated in a reenactment play of the crucifixion of Jesus Christ. Churches from all around the community of every denomination came and shared in the remembrance of Jesus' death. As part of the Good Friday service, attendees were given the opportunity to lay their burdens down at the cross. It was incredibly moving to see everyone vulnerably approach the cross with their baggage and know that as each walked away, God was lifting their load. Jesus paid for it all! On Easter Sunday, our team led a 6am sunrise service on the beach. We celebrated the resurrection of Jesus and the new life we have because of Him! Even this picture pales in comparison to the GLORY of who Jesus is! Some of our plans fell through one day, so we decided to go door knocking around the community and ask if people needed help around their homes or lawns. We were able to have life-changing conversations with some, and we didn't even plan it. God sure has a way of turning the day upside down. This is Mrs. Marsh! She adores gardening, but her old age has prevented her from keeping up with her yard. She hated looking out her window seeing her yard a mess and knowing she couldn't do anything to fix it. We were able to help her with some lawn maintenance and clean up. She couldn't stop expressing how thankful she was! The indigenous people of the city hosted a week long event in remembrance of a young boy named Malachi who tragically passed away three years prior. Every year since, the people gather as a family to play sports, eat food, and enjoy each other's company. We learned how to play edy, a game similar tag. We even played some rugby! Another day we visited the Choir of Unheard voices. This is a choir made up of adults of all different ages with mental and social disabilities. They all come from different walks of life, but music unites them. They take turns conducting the team, and many of them have written their own songs. One in particular was about having the opportunity to shine. This brought such a new perspective of what it means to shine. While the world defines shining as being successful and wealthy, these people agree it is about being yourself despite what anyone things. I like their definition. It was Tess' birthday at the end of the three weeks away! We dressed up one night and celebrated another year of life with laughter and sparklers. We finished outreach in Townsville preparing for YWAM's "I Want to Live" event. It is a yearly event put on during National Youth Week to show young adults the meaning of life and life to the full. Holly, pictured above, came from the local youth prison to give us a helping hand as well. It was an incredible weekend of making friendships and letting people know how valuable they are! Although this outreach wasn't what I planned for or imagined, it allowed me to see what God sees. There are broken people in need of love everywhere. Not only in Thailand and Uganda, but in my backyard. God does not put priorities on His love. His heart breaks for each individual equally. He doesn't operate by location because He doesn't see locations; He sees people. And every person is equally worthy of His love. I used to think of missionaries and think third world counties, places that aren't even on maps. This is an accurate association for a lot of missionaries, but going to these places is not what makes them missionaries. Being a missionary does not always require a passport and include a glamorous story that could be featured on National Geographic. Being a missionary is all about living how Jesus lived. And Jesus lived by only doing what His Father said, loving every individual unconditionally and infinitely. Mission work can happen - and is necessary - in the western world. In the offices, at the schools and universities, in the grocery store. Everywhere you step foot becomes your mission field for the day. There are starving people everywhere. Maybe not physically, but everyone is starving for a touch of love from their Father.